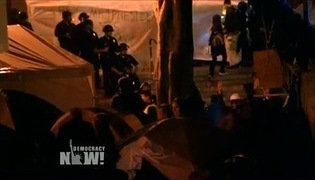 New York Times Coverage of Media Crackdown on Occupy Wall Street Profiles Democracy Now!’s Ryan Devereaux | Democracy Now! 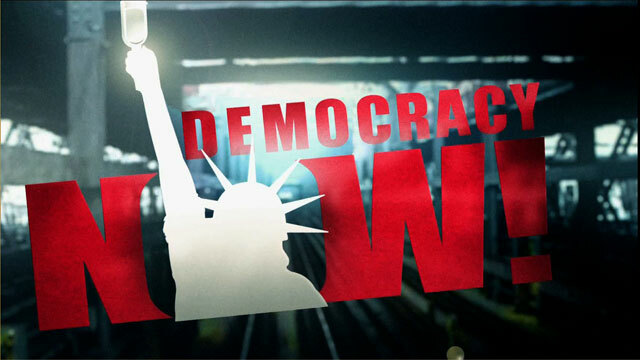 On Dec. 17, Mr. Devereaux covered a demonstration at Duarte Square on Canal Street for “Democracy Now!,” a news program carried on 1,000 stations. Ragamuffin demonstrators surged and the police pushed back. A linebacker-size officer grabbed the collar of Mr. Devereaux, who wore an ID identifying him as a reporter. The cop jammed a fist into his throat, turning Mr. Devereaux into a de facto battering ram to push back protesters. Eventually, with curses and threats to arrest Mr. Devereaux, the officer relaxed his grip. You don’t have to take his word. An Associated Press photograph shows this uniformed fellow grinding a meat-hook fist into the larynx of Mr. Devereaux, who is about 5 feet 5 inches. A video, easily found online, shows an officer blocking a photographer for The New York Times at the World Financial Center, jumping to put his face in front of the camera as demonstrators are arrested in the background.